When the forest suddenly opens, the gaze falls on a gently curved expanse. Fruit orchards, fields and pastures characterise the old cultural landscape. Only a few farmhouses blend harmoniously into the area. One of the houses is called Hazelnut House. That's how we christened it. The hazelnut bushes have always stood in this place and the house has been there since 1851. It presents itself to its guests in a time-honoured and unmistakable elegance. Here is a place of deceleration. It is quieter than elsewhere. The air is clear. In the early hours of the morning the concert of the birdcalls begins. In the evening, when the moon rises, it is time to look into the starry sky. Maybe there is a shooting star. A secret wish is free. In the afternoon slip into the rubber boots and go into the kitchen garden. Harvest the vegetables with your own hands, carry them into the house and prepare them in the kitchen with a lot of love. What a pleasure! On the meadow grow edible wild herbs and the gnarled fruit trees tell the stories of historical, local varieties. Everyday life is moving noticeably into the far distance. The pace slows down. The thoughts of the familiar structures simply fly away. The journey to oneself and the exchange with others begins relaxed yet highly concentrated. There is plenty of room for creativity and inspiration. 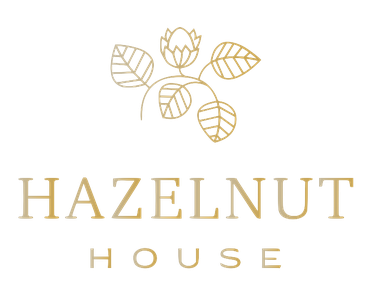 A warm welcome to Hazelnut House.